The colorful culture, art and craft of the city comes to our mind when we think of Jaipur. If you are visiting the colorful city of Jaipur, then Block Printing Tour of Jaipur is one thing you must go for. 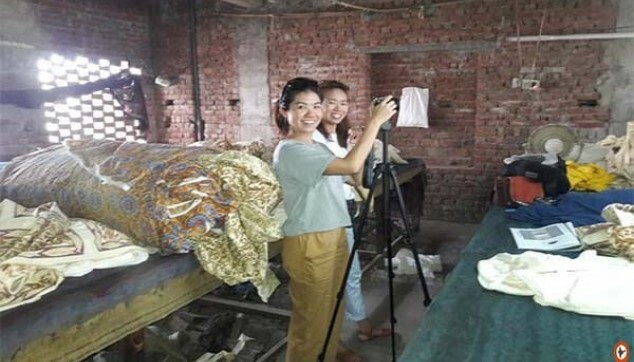 The tour will let you explore the handmade paper industry and the textile imprinting industry. This is perfect for those who are fashion enthusiasts. Please remember to keep your purse full while you visit Sanganer as the place will give you a large number of options to shop from. The Sanganer Day Trip from Jaipur would also take you to the Jain temple. Its architecture is a replica of the popular Dilwara temples at Mount Abu. At 10 am, you will be received from the hotel. The Sanganer Day Tour Package in Jaipur will take you to the town. The key highlight of this small town in Jaipur is its 17th century art form which attracts tourists from different parts of the world. This block printing has given employment to thousands of residents in Sanganer. The prints here show a huge Mughal influence which you could see in the nature of colors, vegetable dyes and floral motifs used. The intricate details of the art and the wooden blocks are made out of sesame or teak wood which will definitely take your heart away. The Sanganeri prints comprises floral and folk designs. You will be surprised to know that it takes around one and a half day to craft one piece of Sanganeri saree. After exploring the block print of Sanganer, you can head to explore the charms of Handmade paper making skills of Sanganer. Finally, see the Jain Temple on this Sanganer Day Trip from Jaipur. The architecture is a replica of the Dilwara Temple in Mount Abu and it is truly a sight to go for. Later, drive back to Jaipur by private car and arrive at your hotel by 06:00 pm. With this, the Sanganer village tour comes to an end. It was interesting to see the conventional method is still alive in some countries. The freshly made pieces looked pretty good. Going to visit the architectures was another surprising thing. You get to know a lot about the heritage and history of India.